Entrepreneurs who are pushed early on to develop their pitch are often put into a precarious situation. There aren’t a ton of credible resources online, so where do you go for quality advice? Take, for instance, our friend Bill. Bill is the owner of a medical device company, which has one product in the early stages of development. He needs to raise $10M for his business to effectively launch, and handle production and marketing over the next five years. But he doesn’t have a detailed view of his financials or costs. He does know approximately what the product costs to make, but it’s just a rough guess based on past expenses. Bill knows the industry as a whole really well, but he doesn’t know a thing about sales, marketing, or running a business. His product is unique, so he’s filed for some patents, but there are also tons of other companies waiting to pounce on this technology and produce it themselves. If Bill is going to effectively pitch his company and his product to investors, where should he start? Whether we’re talking about a medical device company, software as a service (SaaS), a consumer facing app, or any of the other industries and business models, we can look at Bill’s story and see it as a relatable situation for the majority of startups facing the fundraising stage. Bill knows he doesn’t know the “business” side of his business, but he knows his technology, so he knows his company is going to be successful. But does he? Any savvy investor is going to want to see strong a financial base to run the company profitably in the present, a solid team to navigate the waters into the future, and a clear pitch which compellingly lays this out for them to understand and engage with. The following is our advice, based on our own and client experiences, for nailing all four—financials, a solid team, a great pitch, and high-quality engagement. There is no getting around financials. Investors see a lot of financial projections and “hockey stick up and to the right” graphs. They know that projections are mostly BS. Too often founders finish their pro-forma financial projections one time, and then never look at them again. But pro-forma’s are easy to fudge, and projections are rife with unidentified variables. Holding these up as anything more than an educated guess would be optimistic at best. If you have the hockey stick projections in your model, what’s it going to take to actually get those numbers? How much are you willing to invest, to achieve the customer growth you’re projecting? We recommend starting with your projections and pro-forma financials and then iterating the understanding of each of the cost components as you know them. The more rooted in reality your financials are, the better off you are going to be when answering tough questions from investors. And they are going to ask the tough questions. You want potential investors to know that you are helping them manage risk before they even get involved. Knowing your numbers is so important that not knowing them is one of the most common deal-killers. Don’t rest after you’ve done your pro-forma financials. Let that be a starting point and continue to progressively elaborate your understanding of your product/service over time. Costs are probably the easiest thing to lock down. Pricing the second-easiest. Pricing should not be related to cost, but should instead be related to the value the service is perceived to have. Obviously cost comes into play when a customer is making the decision to buy. They don’t care about how much it costs you to make it. They care about how much it costs relative to how much potential value it provides them. Getting your costs down is important, but when setting your prices, ensure you are focused on customer perception of value. Price according to the value and then see if the costs you would incur to make it would be worth it. Pricing based on costs is a dangerous tactic. You either end up leaving too much of your potential revenue on the table, or your price rises so high that the product is not worth buying or producing. Your team is the next most important aspect of your startup. What kind of skills and values does your team have? How are you able to balance each other’s weaknesses, while gaining from the team’s combined strength? What makes you the best fit for running this company? Being able to put together a snap team of well-balanced and diverse individuals will improve the company’s chances for success. To an investor, the risk is much greater when the whole operation relies on the intelligence and will of the solo-entrepreneur. There will be a lot going on in the beginning, and having the right team will greatly enhance your chances for survival. Survival and growth are closely tied, so investors benefit from good teams that are sharing the load and getting things done effectively. Any time major areas of the company are being neglected, like marketing, sales, delivery operations, or financial rigor, the company is in great danger. Your team is there to help you become more balanced in the short-term, and more productive and profitable in the long-term. Looking for diverse skill sets and different backgrounds is not easy to do. It might mean getting out of your comfort zone in meeting people, or challenging yourself to think really deeply about where you need balance and what type of person might give it to you. All too often we find ourselves partnering up with people who are just like us. But if everyone has similar skill sets and backgrounds, the company’s ability to respond in an innovative way is limited. Diverse teams offer the ability to draw from vastly different experiences. The problem-solving techniques used in one industry can really enhance innovation and cause new growth when applied to another industry’s entrenched problems. Without a team that is diverse in skills, experience, and background, you’ll be limited in your results. Investors know this, and they’ll be wary of commitment to one-person organizations or homogenous teams. Don’t skimp on the pitch development. A good product, solid financials, and a great team will really go a long way in hammering home your message to investors. But without a great pitch deck, and a great pitch to go along with it, you are limiting yourself in several ways.  Developing your pitch early will help you get your message down and find the gaps in your business formation and execution strategy. When you are rigorous in the beginning, it will be easier to continue doing the right things throughout your operations. Bad habits are hard to break—so start with good ones! Additionally, these documents can be used to spread the message about your company not just to potential investors, but also potential partners, mentors, and team members. Better and more people supporting you early on means faster growth and a shorter learning curve. Getting your logo, brand, and story down right from the beginning saves valuable time in courting investors. Do you really want to go try your luck with an investor without being fully prepared? You might get only one shot. You will gain insight through each investor interaction. Having a good pitch and good pitch deck right from the start will help your delivery go from good to great in no time. If you start with substandard work, you are lengthening the time it takes to learn, improve through iteration, and then test again. Your burn-rate will always be breathing down your neck, so time is extremely important. The faster you get through funding, the sooner you can focus on the real work of running your company. Spending time doing all of this naturally creates a great ecosystem for your earlier adopters and pre-sales. Marketing is marketing, and although investor and customer communication might be slightly different in message, the underlying content is likely the same. The pitch deck is one of the most complete early marketing pieces you have. This content, which you and your team have taken the time to develop and refine for the investor pitch, should help you simultaneously create compelling customer pitches and start working through the segmentation of your different audiences. Traction is the name of the game here and when approached this way, you can continue to augment your fundraising with more compelling examples of customer engagement, buy-in, and sales. Ideally you could focus on getting people to commit as early as possible, and then design strategies to really hook them into the company and its mission. We’ve talked before about the importance of practice. It is the key to success in both the investor world and the customer world. Practice your pitch and sales process religiously. Watch recordings of your pitch so you can objectively see what went well and what needs work. Elicit feedback from every mentor and investor meeting to gain insight into what investors think, where their hesitations are, and what you could do to make the company’s case stronger in their eyes. Not every investor will be a good fit, but their feedback will nonetheless be very valuable in the long-run understanding of who you are looking for and what you need in a partner beyond money. Remember: practice is the only way to get your funding. Don’t risk failure due to lack of practice. Practice your pitch at least five times before going into an investor meeting. Making at least one of those times a quasi-stressful mock pitch interview—in front of strangers, for example—is ideal to get any final kinks worked out. Granted, the pitch probably won’t go exactly as planned in the moment, but the practice will enable you to better adapt to anything unexpected that comes up. You’ve probably heard the old adage that sales is just a numbers game. While there mat be some truth there, sales and marketing are really much more than numbers. It’s really about relationships—the numbers just help you know when your relationships are in danger. Are you trying to grow your investor map? Knowing more people and engaging them regularly is the key to growing customer and investor bases. Getting in front of people through a variety of communication channels is the key to getting people to care about what you are doing. How many people have you talked to this week? How many different channels did you use to engage your customers and investors? Do you feel like your communication strategy and execution need work? Time spent here will pay dividends. It’s much harder to get a new customer than to keep an existing one. Losing customers or investor interest is a sign of internal decay. Internal decay at a startup! Yep—it’s insidious, and it’s usually there from the beginning. Getting good at delivering a rock solid product and building your back-end systems to support customer retention and satisfaction will really set the organization up for success. So ask yourself: how does this work translate to your pitch deck and investor pitch? Because these are the differences that really help you stand out!